Treat your taste buds to something different with this A.1. Meatloaf. 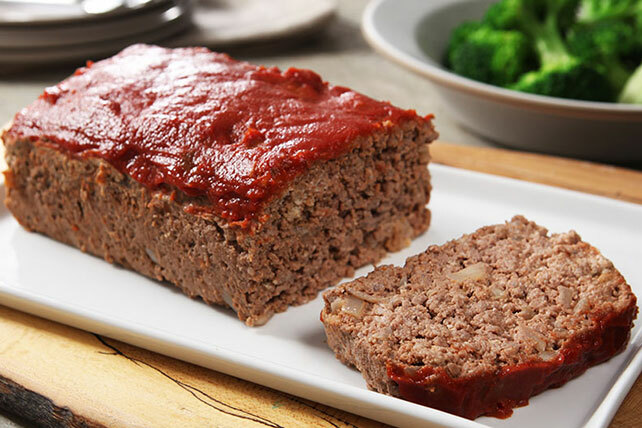 Try this beefy, tomato-y meatloaf recipe made with A.1. Steak Sauce. Reserve half the tomato sauce. Mix remaining tomato sauce with remaining ingredients just until blended. Press meat mixture into 9x5-inch loaf pan sprayed with cooking spray. Bake 1 hour or until done (160ºF), draining fat and topping meatloaf with reserved sauce after 50 min. Save 30 calories and 3g of total fat, including 1g of sat fat, per serving by preparing with extra-lean ground beef. Prepare meatloaf as directed; cool, then slice. Wrap individual portions in foil. Label, date and place in freezer-weight resealable plastic bags. When ready to serve, unwrap and microwave until heated through (160°F). Add 1 small chopped green pepper to meat mixture before pressing into prepared pan and baking as directed. Balance this delicious entrée with smart side dishes, such as a fresh spinach salad and hot steamed green vegetable.